We've seen quite a bit of interest over the last six months or so about Saturn's icy moon Enceladus. Cassini has sent back some amazing image of the moon which is the most reflective body in the solar system, reflecting 99% of the light which falls on it. We've learned that the moon is active, with eruptions of water vapour seen from the 'tiger stripe' features near the moon's south pole. What has puzzled astronomers is why the hot region is at the pole, rather than near the equator. A new model now being considered speculates that the moon may have 'tipped over' as a result of the hot spot. The theory is that as the hot spot developed that region of the moon expanded with the internal heat, and therefore became less dense. Spinning bodies have a tendency to be more stable if more of their mass is close to the equator. Hence the cross-section with least mass will tend to align with the poles. This is a property of spinning objects, not related to gravity. If this is the case the sometime after developing the hot spots, Enceladus tipped on its side to balance it's spin. 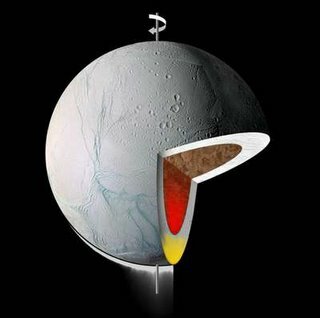 Scientists still haven't worked out the mechanism for heating within Enceladus, although it may be some form of tidal heating.